Home » Asia » Exploring Vietnam » Vung Tau, Vietnam: Jesus Hates Me. This I Know. First off, we took a bus from the backpacker district, because we were there already and the money we’d save going to the bus station wasn’t worth the effort. FUTA Bus Lines is located at 205 Phạm Ngũ Lão (the street that runs along the south side of the long park). Buses leave throughout the day, cost 120,000 dong, and take about an hour and a half. Alternatively, you can go to Miền Đông Bus Station and browse around for the cheapest option. You might save 30,000 dong ($1.50 or the cost of a delicious lunch). Cooling off at the hotel pool. The bus will drop you off at Vung Tau’s bus station. 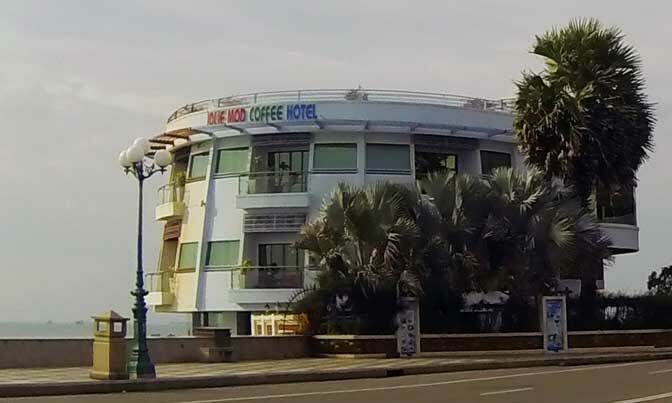 It’s downtown — about a 20 minute walk to Back beach, the largest and most popular beach in Vung Tau. You’d probably be able to find a hotel there no problem. We didn’t want to spend our vacation shooing off hawkers, so we stayed at the south-end of the peninsula across from Pineapple beach. A taxi there cost us 100,000 dong, a bit much but I heard taxis are more expensive in Vung Tau. We stayed at Sunny Blue Cap Resort. It was nice. It looked like it needed to be freshened up, but we were happy to have a pool that overlooked the ocean, and there were plenty of areas to sit and relax. The cost was $35/night. Quick note, we called the hotel ahead of time because we needed to check to see if they’d let us stay there with only a copy of our passports. They said it was okay, but we were told they didn’t have any double rooms left, only triples. We ended up booking a double through Agoda, and when we arrived they put us in a triple (for the price of the double). 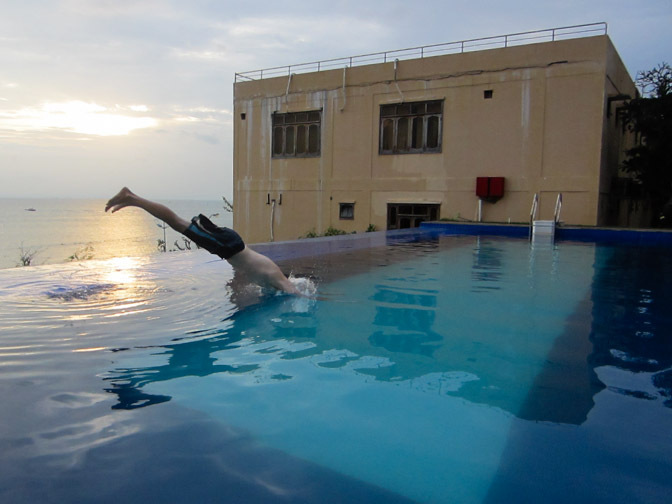 If we didn’t want a pool, we probably would have stayed further down Ha Long street. A cool option would be Hoa Tieu Hotel. I’m basing that on the location, the price (a room with a balcony that overlooks the sea for $25/night), but mostly on the fact that it looked really neat from the outside. Another crazy looking hotel was the Jolie Mod Hotel at 150 Ha Long. It’s circular and right on the water — pretty Bond villain-like. There’s a lot of 80s/early 90s hotels in Vung Tau that are looking a bit outdated and rundown, but pretty cool. After an afternoon of relaxing, we walked along the coast and stopped at New Delhi Indian Food restaurant. It was excellent – the best Indian food we’ve had in Vietnam so far. It’s on Ha Long street (check the map below). Vung Tau livens up at around dusk, when the Vietnamese are off work and looking to unwind. The beaches get busy. People are swimming, exercising, and socializing. Unlike the western world, the Vietnamese don’t go to the beach to sit in the sun. They hate the sun. In fact, they’re called the vampires of Asia… that’s not true. The next day we ate a blah breakfast at the hotel, then rented a scooter from a place down the street. 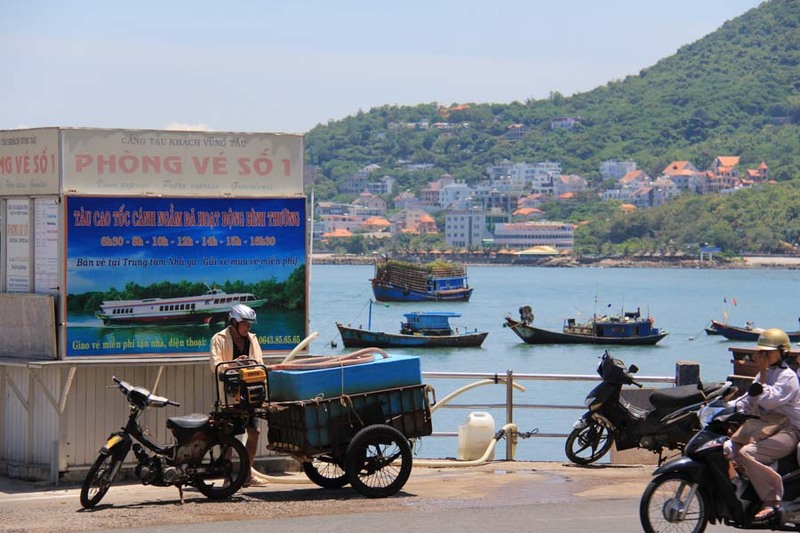 For 150,000 dong, every inch of Vung Tau can be yours. Renting a motorbike is hands-down the best way to traverse the city. The road along the coast is an easy ride with many cafes along the water to stop at. We did a complete loop that was only about 30 minutes of driving and offered much to see. Jesus about to bungee jump. That’s right, we finally gave up our heathen ways and had a visit with the lord. 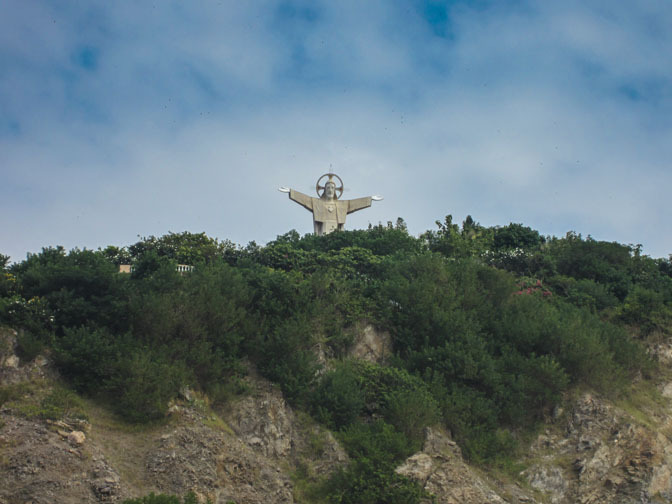 Vung Tau has a huge Jesus statue on a hill that you can go into and climb the 200 or so steps to a balcony on his outstretched arms. We made the half hour hike to the top of Small Mountain only to find out that Jesus doesn’t allow anyone wearing shorts inside of him. You also can’t bring in bags, wear sleeveless shirts, or spit inside of him. Your loss, Jesus. I was pretty sure that climbing to the top of him was going to help me see the value of having Christ in my life, but instead we sat outside making puns at Jesus’ expense. Since Jesus wouldn’t give us the panoramic views of Vung Tau that we so desired, we headed to the lighthouse on top of Small Mountain. When we got there it was closed; we still had access to the grounds, so we got our views, and there was a stand there that sold cold drinks. A shady place with a great view and a cold beer — that’s probably better than a stuffy old lighthouse. 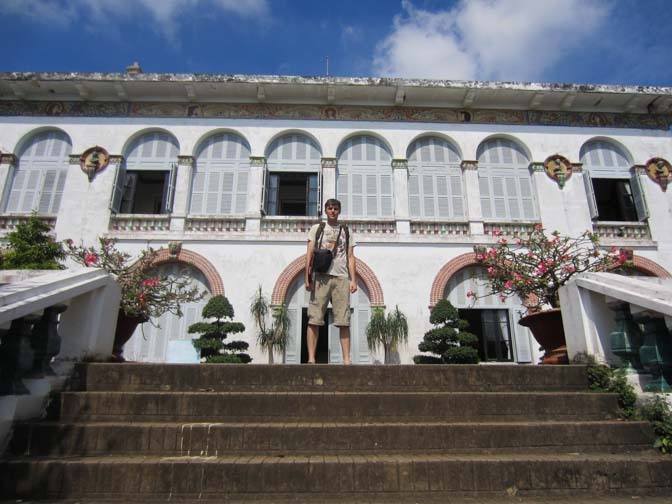 An old French-style house that was once the summer home for the Governor General of Cochinchina, Paul Doumer (who later became President of France before being assassinated). It was built in the early 1900s on the former grounds of a fortress that actually fired the first shot against the invading French ships. The interior is nice. There are some great views, and the palace has a collection of artifacts found on sunken ships from around the area. For breakfast, lunch, or even dinner make sure you try banh khot, a Vung Tau specialty. It’s a rice pancake that’s fried and topped with shrimp. Very delicious! For more information about the dish check out VietnaMenu’s profile on banh khot. Of course, the seafood in Vung Tau is great. If you are looking for a classier dining experience, Ganh Hao has some delicious dishes and it’s right along the coast. We ordered a whole sea bass, plus some crab soup, and some water spinach. The fish was grilled to perfection. Total cost of the meal was about 440,000 dong. If that’s too rich for your blood, Quán Bia Tươi is a better option. The seafood is good, but the highlight here is their cheap draft beer (bia tươi means fresh beer). I think it was like 30 cents for a glass… real cheap, and pretty tasty. We stayed two nights in Vung Tau. In the morning, we headed back to the bus station and caught a Hoa Mai Tourist minibus back to Ho Chi Minh City. It was slightly cheaper than FUTA Bus Lines (95,000 dong), but took longer and the driver was into high risk maneuvers. Most people go to Vung Tau from Ho Chi Minh City, which is a breeze as there are many options. For the bus, I like FUTA (205 Phạm Ngũ Lão) because of their convenient location and clean buses. The cost is 120,000 dong if you buy it directly from their office, but for some reason, if you buy it online it’s 100,000 VND (you’ll probably have a credit card fee for the exchange rate though). If you go to Mien Dong bus station, you’ll be able to get a mini-bus for 85,000 VND. I’d say they are less comfortable though, and they take longer (2 hrs vs 1.5 hrs). The drivers are also a bit crazier, and they’ll make frequent stops along the way. There’s also the possibility of getting a Hoa Mai minibus at 44 Nguyễn Thái Bình. It’s right around the corner from Ben Thanh’s bus station and it costs about 95,000 VND. All the buses will drop you off at Vung Tau’s bus station (see map below) where you’ll easily find a taxi to your hotel. Coming back to Ho Chi Minh City, just head to the bus station and you should be able to find a ride back within 30 minutes. Shop around a bit though. Some will tell you there are no other options, but it’s probably not true. You might have to go up to a specific company’s window and ask, but there should be a few different companies making the trip. Make sure they will drop you at Ben Thanh (if that’s where you want to go). The hydrofoil to Vung Tau is back in operation. After a fire broke out on one of the boats, the service was suspended until the hydrofoils could be updated. A year later, they are back in business. Vinaexpress has the best/lamest website, so I’d go with them, but there are a few other companies that make the trip (Petro Express and Greenlines). I suspect all the companies are owned by the government, but that’s just a hunch. They all cost 200,000 VND on weekdays and 250,000 VND on weekends. The trip is the fastest way to Vung Tau (about 1 hr 20 min), and they drop you off at the ferry terminal, which is closer to the action than the bus station. Don’t think you are going to get a scenic ride though, the curtains will likely be closed and they’ll probably have some Just For Laughs Gags on the TV. You can likely buy tickets when you arrive to the terminal (if the next ferry is full, you might have to wait 30-60 minutes though). In Ho Chi Minh, they leave from 5 Nguyễn Tất Thành (Vinaexpress has a map on their futuristic website). They used to leave from a spot in district 1, but it’s been moved due to some renovations that will likely involve Saigon’s new subway system. In Vung Tau, the terminal is at 120 Hạ Long (or can be seen on the map below). If Vung Tau is a stop on your way north, you can take a bus from the bus station to Phan Thiet (the town closest to Mui Ne). The buses leave at 5:30 AM, 12:30 PM, or 7:30 PM. It takes about 4 hours. The bus also goes through Long Hai, Ho Tram, La Gi and Thuan Nam. When you get to Phan Thiet, you’ll have to taxi it to Mui Ne for about 150,000 VND, unless you can get the #9 bus that goes between the train station and Mui Ne. It leaves every 20 minutes from 5:30AM until 8:00PM. For location and price, go with Pacific Hotel. It’s a large place that almost always has rooms available. Nothing fancy here, but you’ll pay $15-20/night for a large room with a view of the city. For an extra $5 you can get a superior room with a sea view. There are cheaper options if you want to stay on long beach, but for reasons listed above, I prefer Front Beach. I’m a sucker for hole-in-the-walls and cheap beer, so I’d have to say my favorite budget restaurant in Vung Tau is Quán Bia Tươi, where you can get 30 cent glasses of beer, and some very tasty seafood. That being said, you should also try banh khot, the Vung Tau specialty. Quan Banh Khot does it very well (see map below for location). It’s a fantastic budget meal and a great local experience. We have lots more information on budget travel in Vietnam and more to come. At 5:30 AM, 12:30 PM, and 7:30 PM there is a bus that leaves the bus station for Phan Thiet, the closest city to Mui Ne. It takes about 4 hours. When you reach Phan Thiet, it is possible to take a local bus into Mui Ne, but I don’t know which bus it is and how frequent it runs (someone should be able to tell you though), otherwise pay about 150,000 VND for a taxi to Mui Ne. Before you head to the bus station to see what’s available, check out this site and see what it has to say. It’s a new startup company that’s trying to organize all the bus routes so you can buy tickets at one location. It’s only in Vietnamese, so use your translation plugin, or your common sense to figure it out. Not all bus companies are on it, but you’ll find some that you won’t find on any English sites or guidebooks.